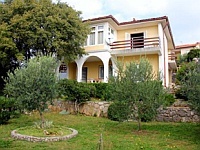 I invite you to look at our personally visited apartments, so you can find your ideal holiday accommodation. If you have decided that you will spend your holidays on the island of Krk, more precisely in the capital city, then I invite you to view our range of apartments for Krk town, where you can find your ideal holiday accommodation which is offered by apartments Krk. 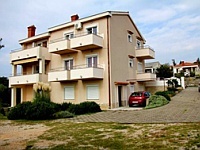 Apartments Bogdanić are about 200 meters away from the sea. 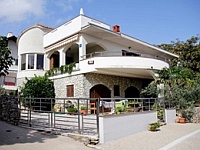 They have four carefully decorated apartments with a terrace overlooking the sea. In the house there is (SAT TV, WLAN internet, air conditioning, washing machine, cooker, kettle, coffee maker, fridge, freezer, shower, kitchen utensils, bed linen, towels. They also allow pets. In the courtyard there is a shared terrace with barbecue and a large parking lot. Apartments Jurina Milana, are about 200 meters away from the sea and the city center. They have 3 apartments for 2 + 1 persons with a terrace overlooking the sea. However, it is possible to hire a studio for 2 people. In the house you have (SAT TV, WLAN internet, living room, kitchen, bathroom with tub. They also allow pets. They have a very large yard where they planted fig and olive trees, and there is also a large parking lot. Apartments Adrijan are about 150 meters away from the sea, 300 meters from the shops and 600 meters from the city center. Apartments include: satellite TV, air conditioning, balcony with sea view, fully equipped modern kitchen with fridge and freezer, coffee maker and microwave, wireless Internet access, secured parking. 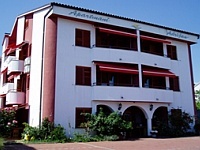 All guests staying in the apartment receive a 10% discount in the restaurant Andreja. Extra charge for pets is € 5 per day.